Sweet peas (Lathyrus odoratus) are a favorite old-fashioned garden plant. The succulent foliage of the vines and sweet fragrance of the flowers makes it an easy choice for decorating a fence or arbor. Sweet peas are cool season annual vines that grow to about six feet tall with one to two inch blossoms in a wide variety of colors. The plants closely resemble edible snow peas with the pairs of one-inch oval leaves that along the twining stems, but they are grown for their colorful, magically fragrant blossoms, rather than for food. Sweet peas can be grown in all zones. Though closely related to the edible peas, sweet peas are actually toxic, so it is wise to plant them away from any edible look-alikes to prevent anyone from picking the wrong ones. One would have to consume a large quantity of the poisonous peas to become seriously ill, however, and their acrid flavor will quickly make it apparent that they are not edible. 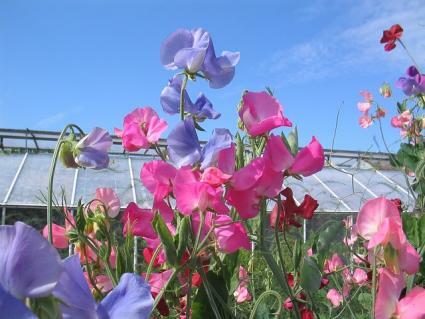 Sweet peas grow well in average garden soil and full sun though afternoon shade is best in hot climates. Good drainage, regular moisture and soil that has been enriched in organic matter are important. The biggest key to success, however, is to plan your sweet pea planting to make the most of the cool weather they enjoy. The plants tend to fizzle in the heat of summer. In cold climates, plant sweet peas as early as the ground can be worked in spring. They are completely tolerant of frost and can go in the ground when nights are still cold. A second planting can be made in late summer for a fall bloom. In places with very mild winters (where it is unlikely to go below 20 degrees), sweet peas can be planted in mid-autumn for an early spring bloom. Sweet peas are easy to grow from seed, but have a hard seed coat that delays germination for several weeks unless it is penetrated. Use a nail file or a pair of nail clippers to nick the outer seed coat of each seed, taking care to not damage the soft center. This will speed germination up to about 10 days, instead of waiting for weeks for the seed coat to dissolve underground. Plant seed directly where they are to grow about two inches deep and two inches apart. After the seedlings are a few inches tall, thin out the weakest sprouts, leaving about one plant every six inches. Sweet peas have tendrils that can grasp onto almost any object and pull the plants toward the sun. The vines are fairly lightweight, so many gardeners simply use twine supported by a horizontal stake five or six feet off the ground to grow them. Wooden or wire trellises are also suitable. Sweet peas can be trained up an existing arbor and are a great choice for beautifying a chain-link fence. Once the plants are a couple feet tall, it's a good idea to spread a layer of mulch over the roots, as sweet peas like cool, moist soil. Water regularly once hot weather comes to extend the bloom as long as possible. Picking off the spent flowers to keep the seedpods from forming helps to encourage repeat blooming. As the weather heats up, don't be surprised if you sweet peas start to look shabby. This is the natural end of their life cycle and they can be pulled out at this time. 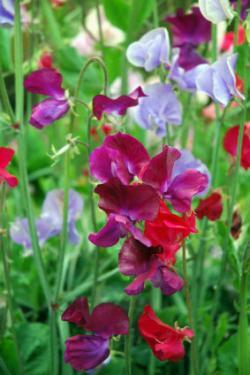 Sweet peas are very tender when they are seedlings and are a favorite treat of slugs and snails. It's best to keep mulch and woody debris away from the plants at this stage to avoid creating a habitat for these pests. If necessary, spread a line of slug and snail deterrent, such as Sluggo or diatomaceous earth, on the soil on either side of the plants to protect them. Once the plants are mature, powdery mildew and other fungal pathogens can show up on the leaves. Avoid planting too densely as the lack of airflow can exacerbate these diseases. 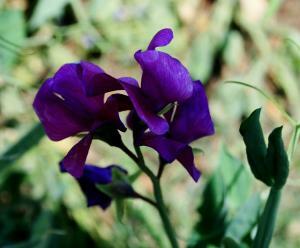 Sweet pea seeds are commonly available in garden centers. They don't transplant very well, so they are not usually found in pots. 'Incense Mix' has a variety of pastel pink, white, cream, and lavender blossoms. 'Flora Norton' has unusual mauve colored flowers. 'Oxford' has dark purplish flowers. 'Prima Ballerina' is a dwarf variety growing about two feet tall with multi-colored rose, cream and lavender flowers. Sweet peas have sweet, soothing, honey-like fragrance that casts a spell on those that grow it. They also make a good cut flower, allowing you to bring their perfume indoors.